Nuno Capêlo is one of those renaissance guys who have way too much talent. He’s an architect-turned-bike-designer, who can sketch out sharp-looking concepts ready to be turned into metal. 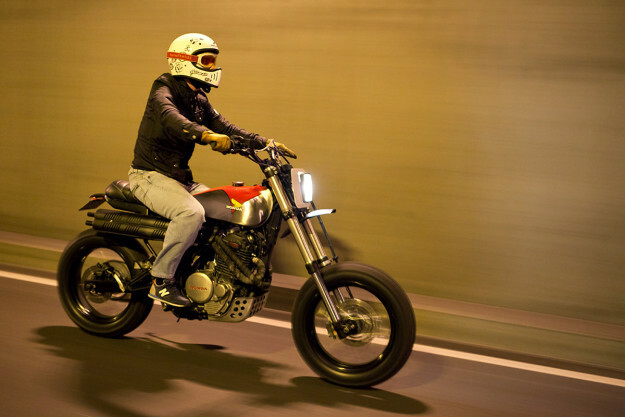 Nuno’s CV includes Portugal’s best builders—including it roCkS!bikes and Ton-Up Garage. 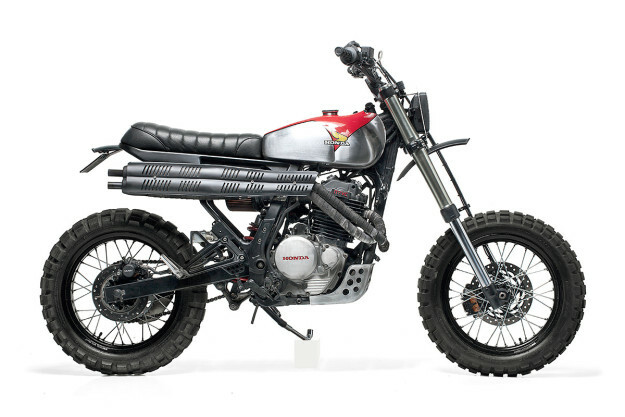 And now he can add this very funky custom scrambler to the list. 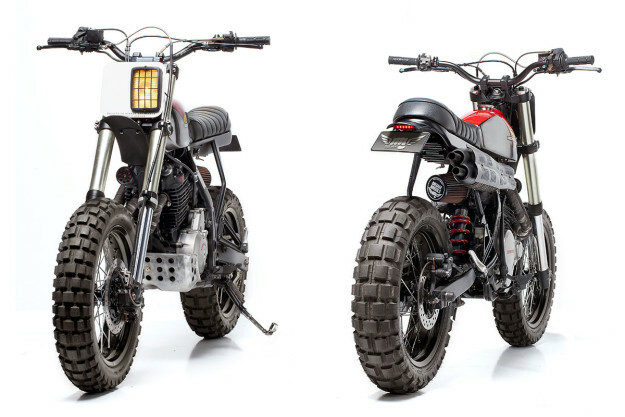 It’s a collaboration with Dream Wheels Heritage, and based on a 1989 Honda Dominator. After a little brainstorming, the guys decided that the bike should be a nod to 70s-era Hondas—referencing bikes like the TL250 and CL450. Nuno would create the design, and Dream Wheels would execute it. To recreate the TL250-esque line and paint scheme that Nuno laid down, Dream Wheels restored and fitted the fuel tank from a Portuguese-made Casal T-185 Trial. 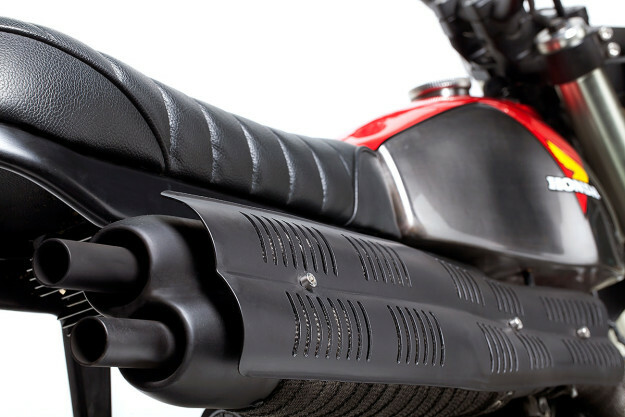 CL450 cues are found in the plump tuck-and-roll seat and the high, two-into-two exhausts. Both items were fabricated in-house. Dream Wheels also built a new subframe, with a discreet under-seat tray to house a gel battery and electrical components. 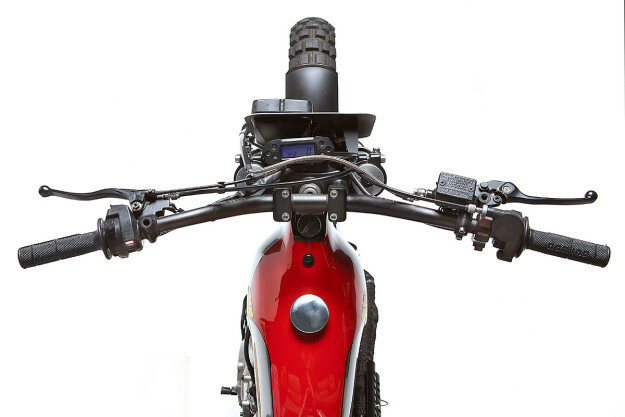 Nominal hand-made fenders were added at both ends, with a small LED tail light peeking out at the rear. The headlight is an unusual feature—it’s an old car fog light, poking through a custom-made number board. Behind it is a Koso speedo, a set of fatbars from Dyna Racing and Domino grips. The Dominator’s engine was stripped, rebuilt, repainted and set up. There’s a new transmission, and the airbox has been chucked for a K&N filter adorned with Dream Wheels’ logo. Up front are a set of Yamaha YZ426 forks—rebuilt and setup for the bike. The stock wheels have been swapped for a pair of 17-inch spoked numbers, wrapped in Continental TKC80s, and the brake lines have been replaced. 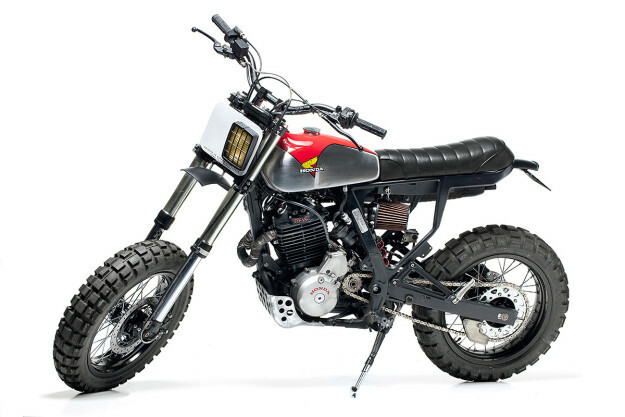 It’s another home run for Dream Wheels, and one of the freshest Honda Dominators we’ve seen. Now if only we could get our hands on the keys.